Great turnout despite the cold last night! Too busy scoping out Lost Weekend’s rad quiver to write down our action alert link? Had one too many of Nick’s hot toddies to remember Governor Cuomo’s phone number? Didn’t have enough warm gear to warrant making it outdoors at all last night? Thanks to our awesome hosts at Lost Weekend! Stop by for coffee sometime (p.s. any coffee drink is just $2 if you bring your own mug!). Our goal is to make this a resource for you to connect with the causes that matter to you. Stay tuned here for updated events, content about our campaigns, and general shenanigans. It’s a work in progress, but just got updated and is getting better everyday. Your input matters. Email me with any input/feedback/ideas. Contact your Council Member. Don’t know your council member? We’ve got you covered. 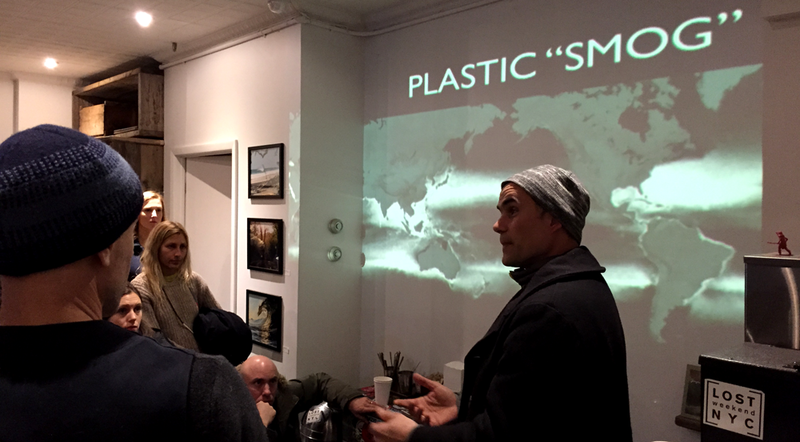 Shoot me an email plastics.rep@nyc.surfrider.org with any questions/ideas. Marcus believes plastic pollution is less of a contained garbage “patch,” and more akin to “smog” – floating and spreading across our waterways. Thanks again to everyone who made it out. See you next time!